Microsoft’s latest version of the Windows Operating System, Windows 8 has not even been finalized, but already downloads of the beta versions that have been publicly made available are quite remarkable. The Windows 8 OS is set to catch up with the tablet interfaces so popular these days, like Android. It may not hold that much of interest for the non-touch screen user, but it is a good step onward for the reliable Windows 7 product. 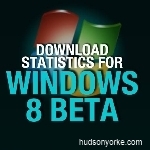 Windows Talk Microsoft Windows 8, microsoft windows 8 beta, Windows 8, Windows 8 beta download. permalink.